Our Heavy Duty Commercial Grade Vinyl Privacy Fence adds actual value to your project backed by our industry leading Transferable Lifetime Warranty. Our Vinyl Privacy fences are high quality commercial grade, that does not compare to the Big Box Store low grade plastic fence that can blow away during the first storm. Our Heavy Duty Privacy Fence is the strongest privacy fence manufactured. Engineered for the Hurricane Coast, our privacy fence is wind certified to 130 mph! 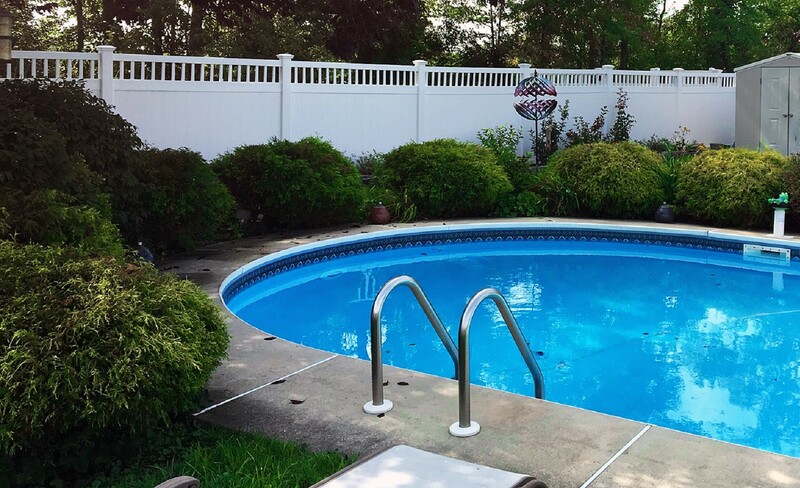 Our Vinyl Privacy fence panels are engineered for all temperatures from extreme heat to frigid cold! No more painting, sanding, staining or replacing your privacy fence! Includes everything needed for your project except concrete and installation. Browse our large selection of commercial grade vinyl privacy fence panels and find the best privacy fence for your project! Purchase the strongest privacy fence manufactured in USA Factory Direct and Save! Fast Shipping. Click pictures below for pricing and details. Our heavy duty Rainier Vinyl Privacy Fence is perfect for your commercial project or backyard. Wind certified up to 130 MPH, features 7/8 x 6 wide T&G Pickets and 5 x 5 posts. Rainier privacy fence is available in many sizes and height options. 6′ Tall, 8′ Tall privacy fence, 10′ Tall privacy fence and up to 12′ Tall privacy fence panels. No wood nor brackets are used with our commercial grade privacy fencing panels. Rainier Vinyl Privacy Fence adds actual value to your property, 100% backed by our industry-leading transferable lifetime warranty. Most orders ship within 3-4 days. Our Heavy Duty Rainier Privacy Fence with Lattice requires no wood or brackets. Very similiar to our Rainier Privacy Fence with the addition of the lattice top. 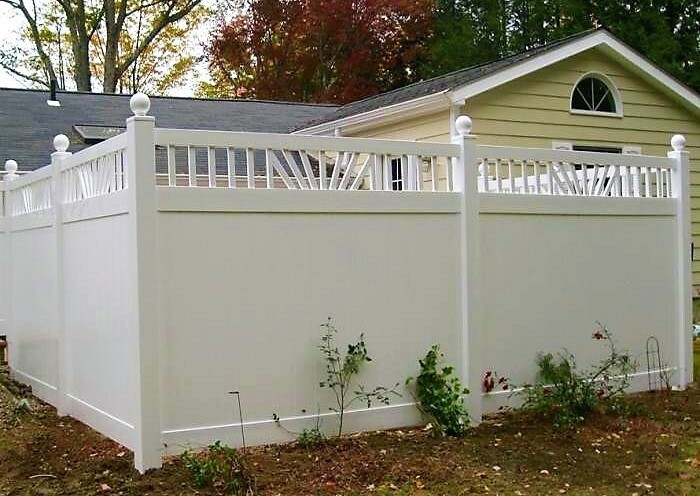 Available in white, clay, tan, gray, or a combination of colors, you will have a fence that is not only durable and superior in stability, but a perfect addition to your yard and home. Available in our standard sizes as well as extra tall panel options, from 8′ Tall privacy fence, 10′ Tall Privacy fence and up to 12′ Tall Privacy fence. Our heavy duty Rainier privacy fence with lattice includes fast nationwide shipping. 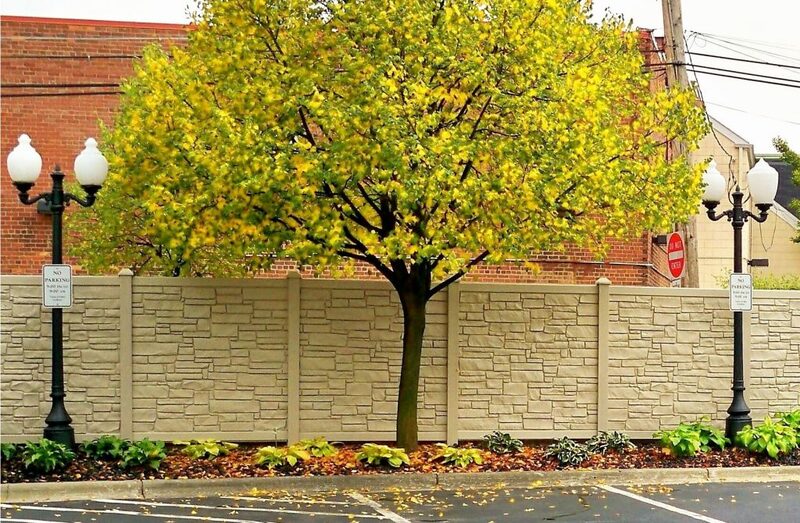 Our Simulated Stone Privacy Fence is possibly the most beautiful vinyl privacy fence ever made. It is the strongest fencing product we offer. 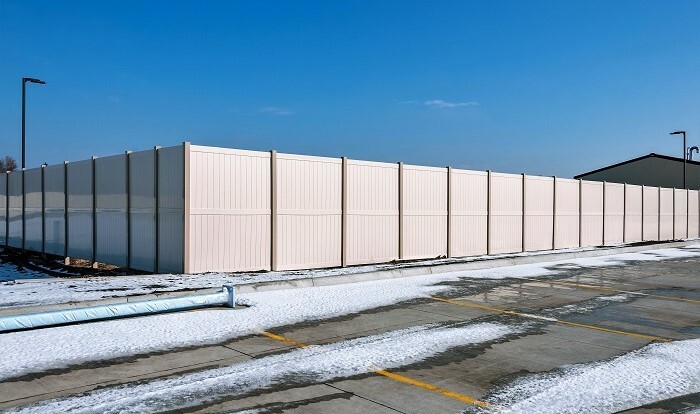 Not only is the fence wind certified up to 130 MPH, it is also approved for use as a commercial sound barrier for Department of Transportation sound wall projects. With this option you can compare the huge savings in cost and labor to traditional pre-cast concrete sound walls. 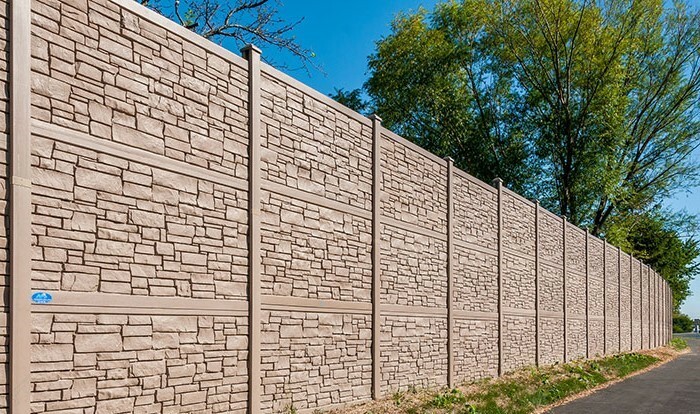 Our Simulated Stone fencing offers the beauty, look, and feel of a masonry wall, at a fraction of the price. Perfect for commercial or residential projects, its been approved as an eco-friendly green building product. Our Simulated Stone Panels are available in six unique granite colors, all for the same price. You can choose from a variety of heights, including 3, 4, 6, 8, 10, 12 or 16 tall sound walls. Call us for 24/7 for a free quote. Ashland is a simulated wood privacy fence panel that looks like a beautiful wood privacy fence without the maintenance! No more painting, staining or replacing your fence! 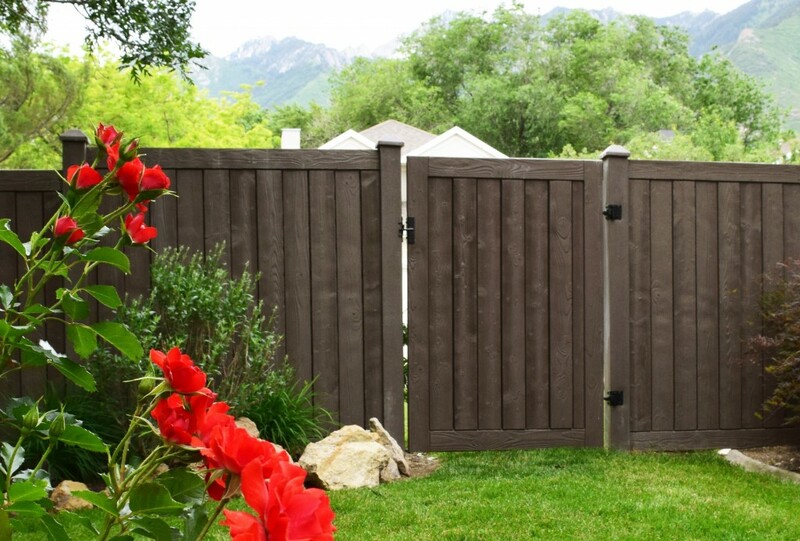 Our Ashland fence has wood grain texture of a natural wood privacy fence, made from low-density polyethylene that is molded to look like real wood. Ashland privacy fence is a green building product eco-friendly and incredibly strong. Ashland Privacy Fencing includes a steel frame encased in each panel for commercial strength and is wind certified up to 130 MPH. Ashland privacy fence is available in five color options: Walnut Brown,Nantucket Gray, Black Oak, Red Cedar, and Golden Cedar, all 100% backed by our commercial lifetime warranty. Black Vinyl Privacy Fence is available in three different styles. 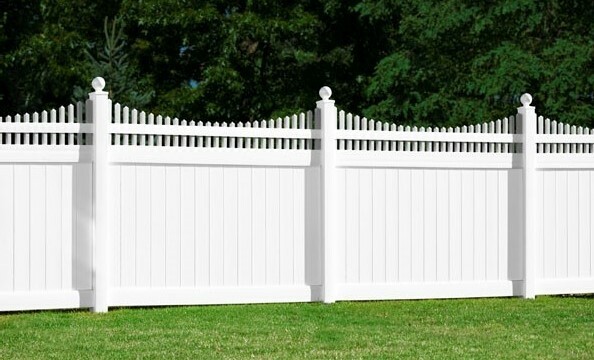 Choices include: Solid Privacy Fence, Lattice Top, or Decorative Picket Top. Made with the highest quality protectants, black vinyl fence has been field tested for over 11 years and manufactured for all climates. Wind certified to 130 MPH, plus our Black privacy fence includes aluminum in the Top and Bottom horizontal rails for commercial strength. As always we provide 24/7 installation support. The Shasta heavy duty vinyl privacy fence is more than just a privacy fence. 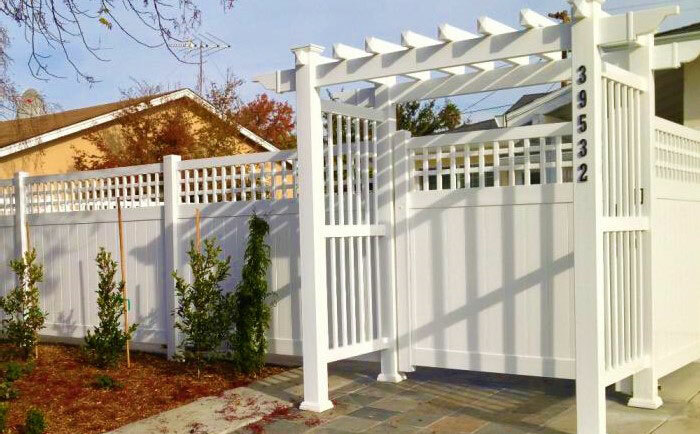 Our Shasta PVC privacy fence has a scalloped open-top picket design, which gives it a very distinct look. The 28 pickets on the top are spaced 1.7 apart, and the bottom rail includes an aluminum I channel for superior stability. No wood or brackets are needed with our heavy duty privacy fence. Available in either tan, clay, or white colors, and installed with 5 x 5 posts. We specialize in commercial projects that require DOT approved sound wall. Our Sound Wall is available in many different sizes and color options. View our 8′ Tall Sound Wall or our extra tall sound wall 12′ Tall sound wall panels. Backed by a commercial lifetime warranty, our simulated stone sound wall panels will save you time and labor during installation. This will save a lot of money compared to traditional labor intensive precast concerte sound wall products. Perfect for back yards or commercial sound wall projects. Our heavy duty extra tall privacy fence is pefect for projects that require privacy fence 8′ tall, 10′ Tall privacy Fence and up to 12′ Tall privacy fence enclosures. Our commercial grade extra tall privacy fence is the strongest vinyl privacy fence manufactured in USA. 100% Backed by our industry leading transferable lifetime warranty. We use heavy guage Aluminum which will not rust, in the top, mid, and horizontal rails, along with Aluminum H Beam post inserts for commercial strength. Available in white, tan, clay, or combine colors for a custom look. Our Heavy Duty Texas Vinyl Privacy Fence offers the perfect combination of privacy and decoration. It molds the style of contemporary design with the durability of vinyl, making it one of the best products on the market. Choose from tan, clay, or white colors or a color combination. Neither wood nor brackets are required for our heavy duty fence. The bottom rail features an aluminum I channel, for commercial strength. Install Texas fencing with 5 x 5 posts along your commercial or home property line. 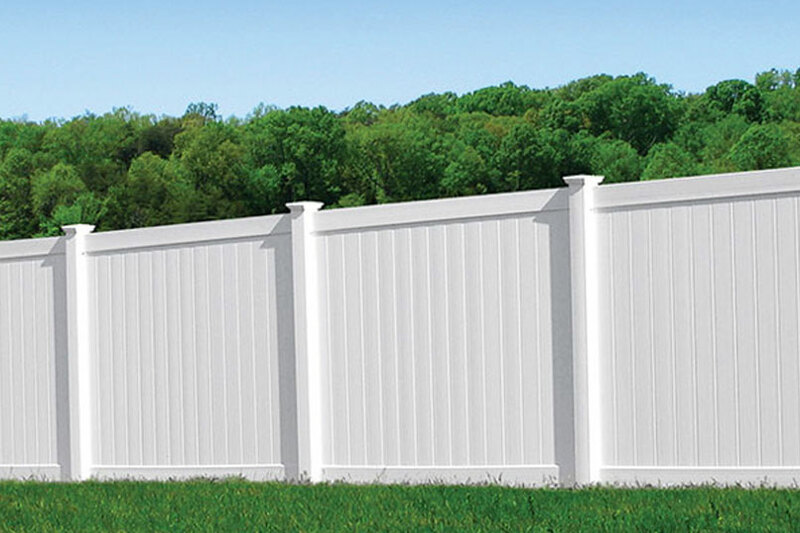 The Minnesota vinyl privacy fence provides a seamless combination of privacy and style. Each panel includes 3 horizontal rails and 27 topper pickets. It effortlessly blends the durability of vinyl with a contemporary look, making it one of the most sought-after products on the market. Choose from tan, clay, or white colors or color combo. The bottom rail features an aluminum I channel, offering unmatched stability. Minnesota privacy fencing includes heavy duty 5 x 5 posts and is very basic to install. Illinois vinyl privacy fence is very similar to our Rainier with Lattice. The difference is that our Illinois privacy fencing uses our unique 3D Square lattice topper. 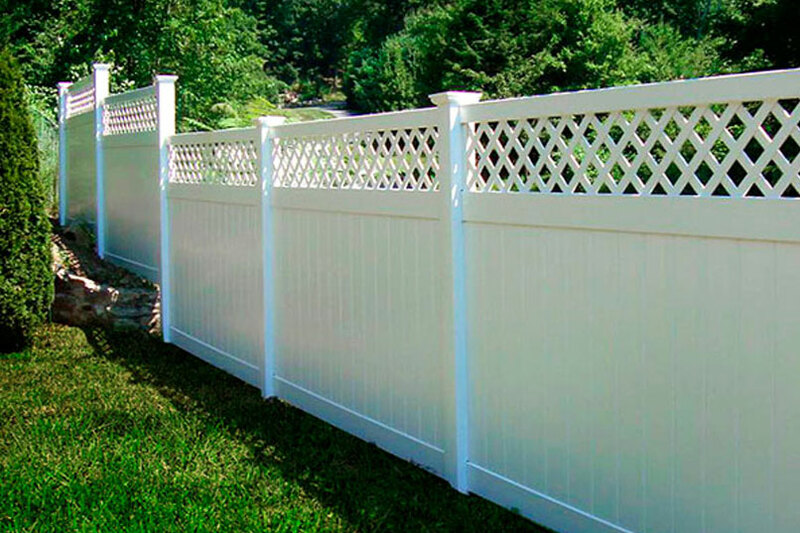 With its beautiful lattice design, our Illinois vinyl fence panels offer complete privacy and stylish decoration. Each panel includes aluminum in the bottom rail for added strength. Installation is simply labor and common sense. As always we provide written instructions and free telephone installation support to ensure your fence is installed correctly. Choose from tan or white colors, or a color combo. Neither wood nor brackets are used or required for installation. Ohio Vinyl Privacy fence feature .75″ black round aluminum spindles for the top of the fence panel, creating a visually stunning privacy fence. 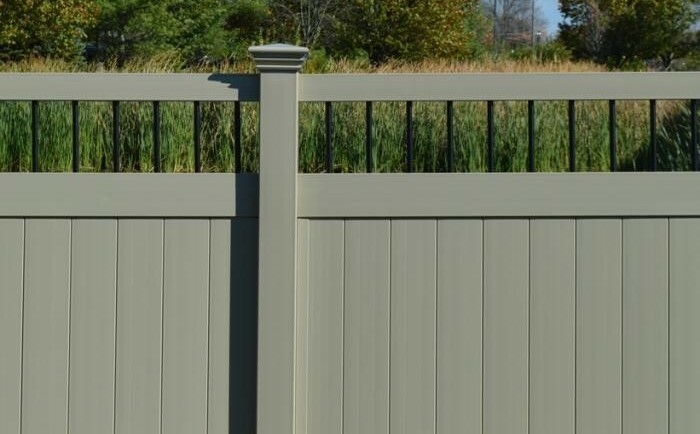 As a cool option, you can create your own custom Ohio Privacy fence, by selecting between five color options; white, tan, clay, gray or color combo which combines any two colors listed. For example, you can choose white posts and white horizontal rails, and clay, tan, or gray interior. As with all of our heavy duty privacy fence panels, our Heavy Duty Ohio Privacy Fence adds actual value to your project 100% backed by our industry leading transferable lifetime warranty. New York vinyl fencing features 27 topper pickets cut in various lengths to create a wave look on the top of each panel. The New York privacy fence includes 3 horizontal rails and the bottom rail includes aluminum for commercial strength. Our panels ship fast along no matter which fence style you choose. Most orders are on the road within 3 business days. Choose from tan, clay, or white colors or color combo. Wood or brackets are never required. California vinyl privacy fence panels feature a sunburst picket topper design to represent the sunshine state. Each panel includes 3 horizontal rails with aluminum in the bottom rail for bolstered strength. The California privacy fence adds curb appeal and value to your property as all of our fencing styles are backed by a transferable lifetime warranty. 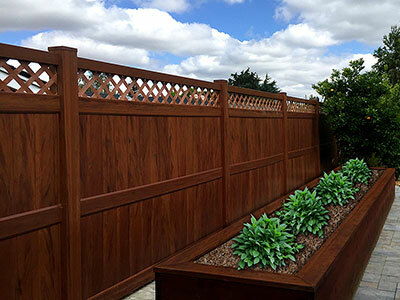 Mocha Walnut Privacy Fence is available with our without Lattice top. 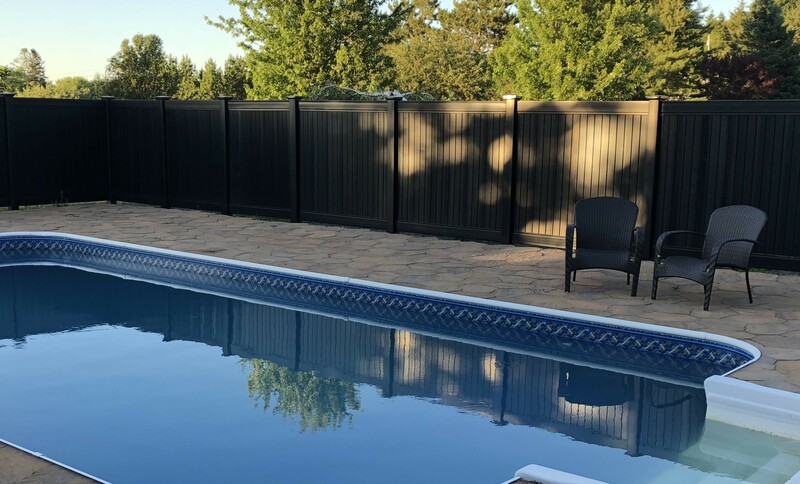 Heavy duty vinyl privacy fence panel that features our beautiful Wood Grain Color with or without our Lattice Accent at the top of the fence panel. This is a head turner, as it looks like a beautiful real wood fence, without having to paint sand or stain ever again! Basic to install and available in various heightsm, Mocha walnut vinyl privacy fence is a beautiful privacy fence panel to enhance your back yard or landscape project. Florida privacy fence is wind certified to 130 MPH, perfect for commercial project or even your backyard. 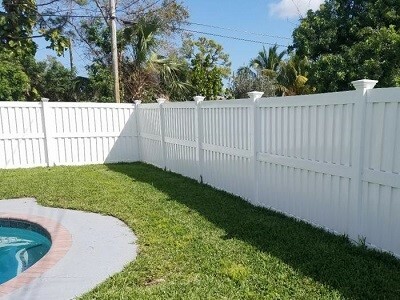 Each Florida privacy fence panel has no spacing between the pickets for 100% privacy and includes a mid horizontal rail for added strength and an enhanced look. Features a 7/8 x 13 7/8 wide interlocking profile. Very basic to install, as always we provide 24/7 install support. Our Florida privacy fencing is currently only available without Lattice. Available only in white color. See for yourself just how strong and durable our vinyl fencing is! This video shows how our heavy duty Rainier vinyl privacy fence stands up to a 130 MPH wind load! No problem! You can buy factory direct and save on the strongest vinyl privacy fence manufactured today for your residential or commercial project. To make it easier on your wallet, we offer large project discounts and truckload discounts in addition to our fast worldwide shipping. But thats not all. We take great care with each order from order placement, to packaging, to shipment, and through installation. As a leader in the industry since 1995, weve made it our job to make sure that everyone who needs help with their project has a place to call on 24-hours per day. We are always ready to help and hope to work with you on your project. Why Consider Vinyl Privacy Fence? The strength and flexibility of our heavy duty vinyl privacy fence makes it a perfect option to install in locations that experience intense weather such as high winds. Our heavy duty vinyl flexes four times further than wood and has twice the tensile strength of wood. During the last big hurricanes in 2017 Texas and Florida, wood fences where destroyed all over the Keys and Houston. Our heavy duty privacy fence was one of the few fences left standing. We have testimony and pictures from various customers on our google plus reviews. 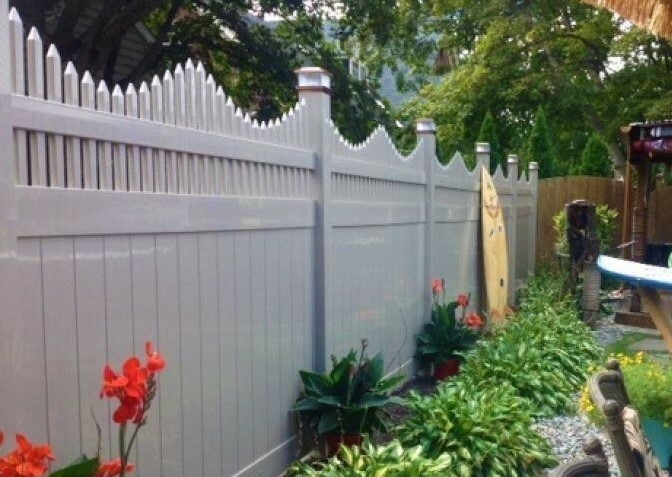 Our vinyl privacy fence is engineered to stand up to extreme weather in all climates. Our vinyl fence is also favored in coastal areas that experience a considerable amount of salt in the air as our privacy fence does not corrode. The maintenance needed for our vinyl privacy fence is minimal. If you want it to look new again simply washing it once a year with soap and water is all that is needed for it to remain in top condition and always look like a freshly painted fence. Because our vinyl is commercial grade and does not lose its color, you will never have to paint or stain like you would with a wooden fence. It does not require the application of primer or chemicals and defends itself against rust. There is no risk of decomposing or succumbing to termites or insects. In addition, vinyl privacy fence is not manufactured using unsafe chemicals like treated lumber uses. Our fence will never dry rot and is completely nontoxic. The cost of purchasing a vinyl privacy fence might cost a little more to start however it will save you money and time in the long run compared to wood or iron. Because there is no care required, you will avoid the maintenance costs that wood and/or iron requires, plus you will never have to replace it again as it is a lifetime product. Most importantly, our heavy duty privacy fence adds actual value to your property as it is backed by our industry leading transferable lifetime warranty. What this means, if ever you sell your home, our lifetime warranty transfers to the next owner! How cool is that?! Our fence adds actual value and curb appeal to your project vs a wood fence that looks old within a year if you do not work to maintain it. 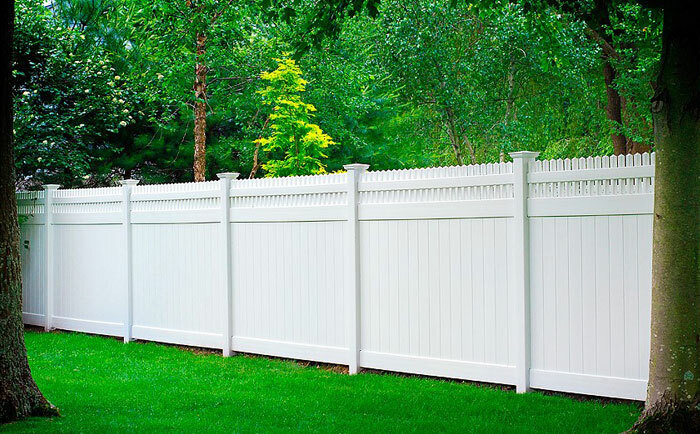 A wood fence adds only maintenance,future labor and material costs, where as our quality vinyl privacy fence adds actual value and curb appeal to your property. Our heavy duty vinyl privacy fence is very easy to install. Most people can install our privacy fences quickly without the help of a contractor. 90% of our clients install on their own with our 24/7 install support. We provide detailed written instructions plus we are with you every step of the way, and always available over the phone to provide installation support to ensure your fence is installed correctly. This is another reason why our vinyl privacy fences will help you save money, as you can avoid the costs associated with paying a professional to assist you. Installing a vinyl privacy fence has limitless advantages that make it a much better option than other products. Vinyl is stronger, lasts longer, and adds actual value and curb appeal to your project. If you would like to learn more about our products or installation, contact us online or call and speak to a fence expert. This is all that we do and we want to help with your project! Give us a call or email us anytime as we are always here ready to assist with your privacy fence project! 507-206-4154.